Long rods, thin tippets, small flies - it doesn't get any better. Some time ago, I decided to move the midge hooks off the micro fishing hooks page. I now think that was a mistake and am moving it back. At least for a while, the midge hooks will be on both pages. Eventually, they will be on the micro hooks page only. The Daiichi 1120 size 20 and 26 are back in stock. I have found them to be ideal sizes for micro Killer Buggers. I have been asked repeatedly for size 28 and 30 hooks. 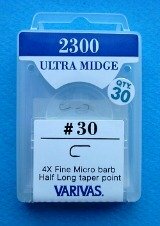 The size 30 Varivas 2300 Ultra Midge hooks are very nearly as small as the Tiemco 518 #32. They seem to be a bit finer wire and perhaps a bit more brittle. I have not been able to get the Tiemco 518 #32 for a couple years now. International shipments require additional postage. Add the required postage at the bottom of the page.